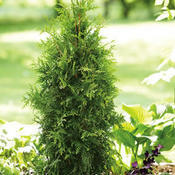 Fast growing, cold hardy Western Arborvitae. Excellent winter color. Good for screens. Deer resistant. 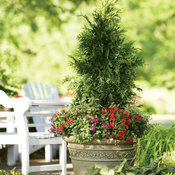 Excellent landscape plant that grows quickly, excellent as a screen. Good to hold banks, as a specimen, and in winter gardens. Good for woodland gardens, as screens and in shrub borders. Prefers moist, well drained, fertile soils. Adaptable to a range of pH. Best if pruned in late fall. Medium moisture. Often found in the wild on moist flats, slopes, banks of rivers and swamps, even found in bogs. Evergreen shrub. 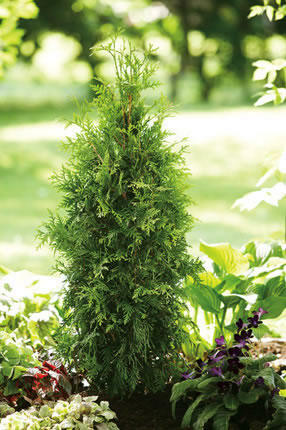 Fertilize in early spring by applying a slow release fertilizer specialized for evergreens. Follow the label for recommended rate of application. The solution to deer problems! 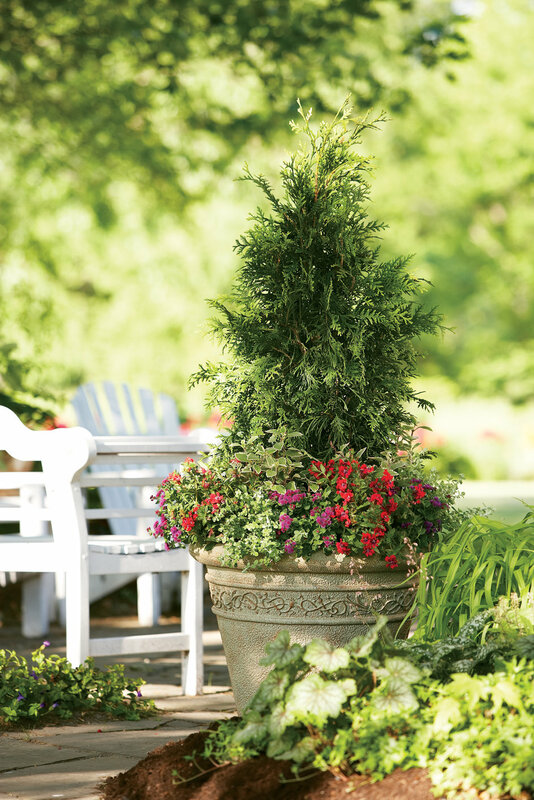 This fast growing, cold hardy selection of Western Arborvitae shows excellent resistance to deer browsing. Spring Grove was selected for its superior winter color and hardiness. It maintains a dark green, glossy color even in Midwest winters, and has survived -25 degree temperatures. 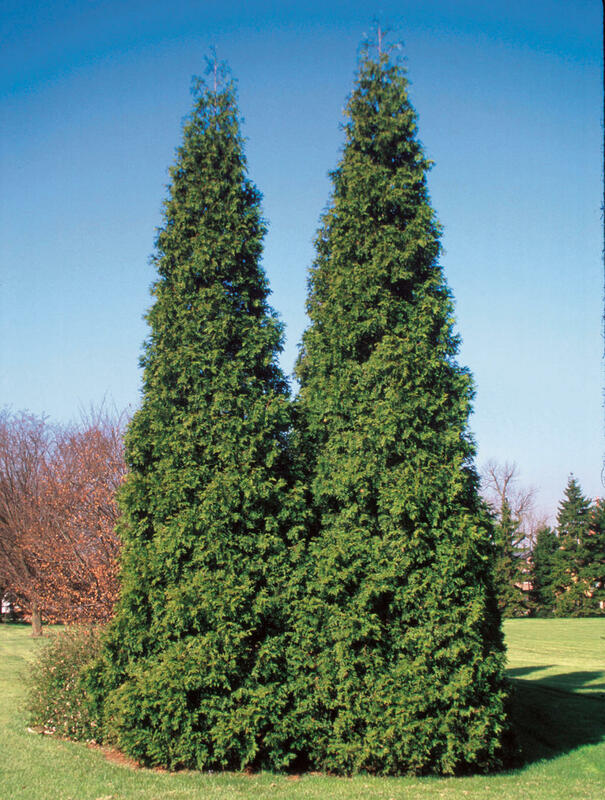 The tight pyramidal habit works nicely in landscape designs, and its hardiness and deer resistance makes it a good choice for many suburban locations, especially for creating fast-growing privacy screens. We planted 13 trees, each between 4 and 5 feet tall in May 2010. 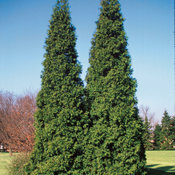 These beautiful trees are now between 17 and 19 feet tall and have proven to be hardy, fast growing and beautiful! Pruning/thinning branches causes spurts of upward growth. We live in South Central Washington, a semi-arid desert. 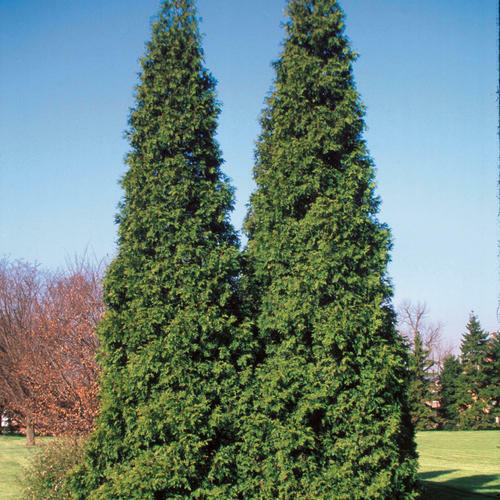 These trees have been exposed to our harsh desert heat with triple digit temps for weeks at a time and have been coated with ice and snow during the winter but do not show the stress our Emerald Green Arborvitae do. At time of planting we added peat moss to our sandy soil and give these trees plenty of water. We are rewarded with a beautiful, hardy, fast growing privacy screen! I need to buy 6 more! All around the best in every way ! it even smells nice. I love this tree! It is great in the winter whether there is tons of snow or ice, this tree keeps its shape and doesn't break. Wonderful the rest of the year for a screen from the neighbors. The deer never touch it! Fast and beautiful, nothing bothers it. It does need full sun or it will grow slowly. I have some in a shady area, they are just OK, the other 15 are in full sune and grow about 1.5-2 feet per year. This variety of western arbovitae is outstanding in all respects. It grows fast, but has a central leader that grows strong. It has withstood 80 mph sustained wind for 9 hours and many ice storms without even breaking a twig.